We satisfy the current and future requirements with our efficient, innovative and premium quality concept. 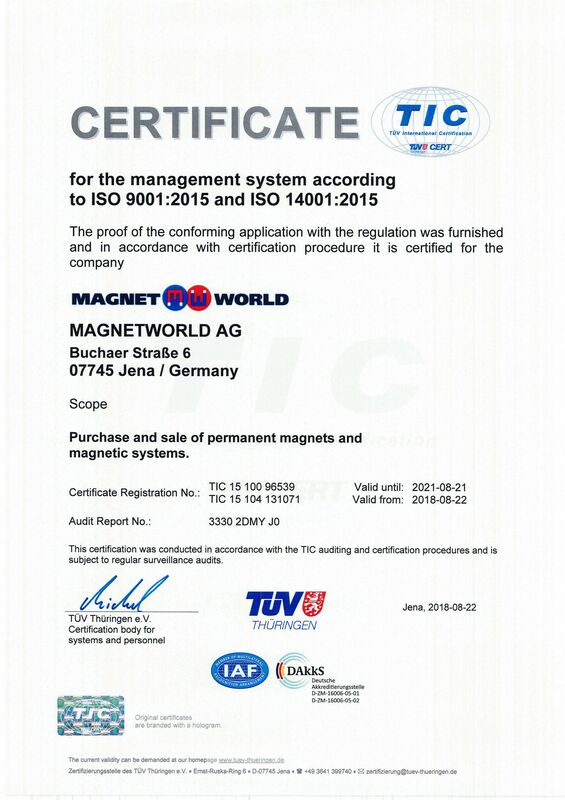 We use an internally developed quality control system for magnets. In addition, we have been certified in accordance with DIN EN ISO 9001:2015 und DIN EN ISO 14001:2015 since 2009 and re-certified until 2021. We successfully completed the development of our new quality concept in 2013. We are therefore in a position to offer tailor-made magnets with 100% quality control at the customer's request. This is an innovative precise measurement system for permanent magnets. The MagCheck allows the magnetic moment and magnetisation angle errors to be measured in real time using multi-sensor metrology. This makes it suitable for quality checks for various permanent magnets. New measurement system to visualise magnetic fields. The HAMOD is a high-precision real-time measurement system for magnetic flux density, visualisation of the magnetic field distribution and field inhomogeneity using magneto-optical sensors. This measurement system is ideal for quality assurance activities for dipole and multi-pole magnets, encoders as well as bank cards, etc.